You can see what I made of Manchester Airport (again!) after the gallery. This was the fifth time I’ve flown from Manchester in the last two years and I’ve had mixed experiences. I suspect that my feelings about Manchester Airport are related to how busy it is. This time, for example, it was quiet, and I was relatively happy. I think it also depends on which gate I leave from: on this trip it was gate 55 (while flying on American Airlines flight AA055, which pleased me far more than it should have done, particularly since I drove along the A55 to get to the airport…). Compared to previous experiences, particularly when I last flew from Terminal 3 in September, this was a breeze. The difference is probably down to the flight. Last time I was catching a busy shuttle to Heathrow, while this time I was flying transatlantic. As a result, the gate was comparatively large and spacious, and, miracle of miracles, it had seats, although nowhere near enough to accommodate a full flight (I estimate that the flight was about two-thirds full). I also suspect that we’d have been struggling if it had been a bigger plane than the Boeing 757 I was flying on. As it was, most people seemed to have a seat, although the gate area was woefully short of power-outlets, with just one side-counter with a row of eight power-plugs and just four stools to sit on, shared between five gates. In the past, I have been a bit snippy about Manchester Airport security, but this time, when it was less busy, it was a breeze. One thing that Manchester has cracked is the whole unpacking/packing business which you have to go through. With two phones, two laptops, my Aergrind coffee grinder and my Travel Press, I have plenty of things to take out of my bag and then put back in again once I’ve cleared security, so I really appreciate how easy Manchester makes this. In contrast to the old way of doing things, where one person at a time put their bags, etc, on the end of the conveyor belt, at Manchester (and, in fairness, at many other airports these days) there are four parallel bays, with trays underneath. You pull out a tray, load it up, then put it on the conveyor belt. If, like me, you end up filling multiple trays (I usually manage three) it makes the whole process remarkably easy and it also means I’m not holding other people up. At the other end, there’s also plenty of space where you can take your trays to pack everything up again once you are through security. The final piece of the puzzle are the staff. Having flown from many airports around the world this year, the staff at Manchester, particularly on the latest trip, are the most helpful, polite and courteous that I have met, and that goes a long way to helping the entire process go smoothly. It was such a pleasant contrast to my experiences at Newark, for example. For once I was at the airport ahead of time. My flight was due to leave at noon and I was at check-in by 9.45 and through security by 10.15. Since there was plenty of space at the gate, I just made my way there and waited for the flight to board. Normally for a transatlantic flight, I just hang around until the last minute, then make my way on when the queues have subsided. However, American Airlines, in common with most US airlines, boards by priority groups (one to seven, with one going first). I don’t know why this should make a difference, but it does seem to stop people queuing before boarding’s announced, so when my group (five) was called, there was no-one waiting at the check-in desk, so I just sauntered up and went straight onto the plane. It probably helped that, having got to the gate early, I was sitting right next to the check-in desk. Sometimes these things just work themselves out. You can see how my flight went after the gallery. Compared to my two previous flights, where I left at 9.25 in the morning in June and two o’clock in the afternoon in September, this one neatly straddled them, departing at noon, which meant leaving for the airport at the relatively sensible time of just after 8 o’clock. I was, for the only time on these three trips, flying direct, which saves a ton of time. In June, I left Manchester at 9.25 to arrive in Chicago at 16.20. In September, I left at 14.00 and didn’t arrive until after 19.00. In contrast, although leaving at 12.00, this time I was on the ground in Chicago at 14.35. Best of all, it avoided the hassle of having to traverse another airport. Of the three flights, it was also the cheapest at £460, compared to £540 in June and £750 in September (the equivalent cost before I upgraded the return leg to business class). Of course, so much of the price depends on demand, the time of year you’re flying and when you book. Whereas the first two flights were booked about six weeks ahead, this one I booked 10 weeks before I flew. I also shelled out for my customary exit row seats, which set me back £210, a hefty percentage of the overall cost of the flight, but still worth it (and roughly comparable to the other two flights). I’ve said it before, but the US-based airlines seem to do a far better job of providing seats with extra legroom (and then charging a lot more for them!). That said, I’d rather pay more and have a proper seat, with a decent amount of legroom, than pay less and not really get any worthwhile space. 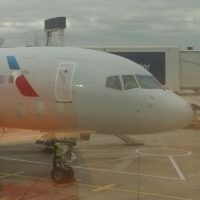 American Airlines currently flies Boeing 757s between Manchester and Chicago and, based on my experience on the flight in June, which was also on a 757, but operated by United, I wasn’t looking forward to it. Back then, I sat in the over-wing exit row, halfway down the main cabin. In contrast, American Airlines has a much better cabin layout, the front portion of the economy cabin given over to premium seating, with nicer seats and extra leg room. While United does a similar thing, I don’t remember being as impressed! In particular, the American Airlines 757s have four seats right at the front of economy, by the doors, which is where I sat. These seats are preferable for a number of reasons, not least because there are only two of them on each side, compared to a normal row of three, with the one on the outside missing to make room for the door. There’s also a bulk-head in front, so there’s plenty of space and so much legroom. There are downsides though, including nowhere to stow anything for take-off and landing and the less-than-satisfactory fold-out arm-rest table, but these are both sacrifices I’m willing to make for the extra room. There are other drawbacks. Unlike the 787s, where the bulkhead seats at the front of economy are out of the way of the toilets, here there’s a toilet directly ahead on the left-hand side, so there was the minor annoyance of having people occasionally standing around in front of my seat while waiting to use the facilities. However, perhaps the biggest disadvantage comes when boarding the plane. Since the seats are right next to the main entrance, there’s a constant stream of passengers coming through as they board. There’s one other thing to say about the American Airlines 757s on this route and that’s a lack of a personalised in-flight entertainment system. Rather than each seat having its own screen, there were a series of TV screens along the cabin, so everyone had to watch the same movie. Personally, it doesn’t bother me, since I long again gave up watching movies on flights, but if you like your in-flight entertainment, you might want to take that into consideration. Note that if you fly business class, you get your very own (large) tablet in-lieu of an entertainment system. All things considered, I much preferred this 757 to the one I flew out on in June, the final bonus being that all the premium seats in the front section of economy have at-seat power. While this means you have to pay for the privilege if you do want to charge your laptop, I really appreciate it. While I can just about eke out my battery for an eight-hour flight, being able to plug it in makes such a difference. It’s also worth noting that there’s just the one plug between the two seats (I didn’t check the seats further back, but I suspect that there are two plugs between the three seats). However, I was fortunate enough that the seat next to mine was empty on the way out, while on the way back, the person next to me just wanted to sleep, so this wasn’t a problem. The flight itself was a pleasure. The service, as I have come to expect from American (on transatlantic flights at least) was excellent, the food was very good (although, slightly disappointingly, the vegetarian meal was mushroom stroganoff again, but it did mean I got another awesome cherry crumble cake) and for once the main cabin lights were never dimmed! It was still a little strange flying all that way in a narrow-bodied aircraft, but this was less disconcerting than when I flew half-way back in the cabin in June. You can see how I fared on my return after the gallery. I wrote (on the previous trip) about the pros and cons of departing Chicago’s O’Hare airport with various airlines. On these three trips, I’ve departed from Terminal 1 in June with United, Terminal 5 in September with British Airways and this time, as I feared I might since I was flying with American Airlines, I departed from Terminal 3, effectively American Airlines’ terminal at O’Hare. My trepidation was largely a result of my experience of flying out of Terminal 1 in June, whereas the actual experience was nowhere near as bad as I anticipated. Check-in was smooth enough and, despite a large queue at security, I got through in 10 minutes, which is almost unheard of in my experience. I’m not sure what was going on though: after years of being conditioned to take everything out of my bag, the staff were telling me to put things back in, including my laptops! It was very surreal. However, the result was that we whizzed through security (I didn’t even have to take my boots off, which usually adds a few minutes to the whole process, although that’s mostly having to put them back on again afterwards…). Whatever the reasons behind this, I wholeheartedly approve! A slight downside of all this was that it left me with two hours to kill before boarding, since I’d arrived at the airport three hours before my flight (I was reliant on public transport, so it was either that or arrive 90 minutes before my departure, which would have been cutting it very fine). On the other hand, one thing that American airports do much better than their British counterparts is gate assignments. If this had been a British airport, I’d have been hanging around in some central waiting area, not able to relax, constantly checking the monitors to see if my gate had been called. Then I’d have to pack everything up and decamp to the gate. Instead, my gate was printed on my boarding pass, three hours ahead of time, so as soon as I got past security, I headed straight for the gate and planted myself there, using the time to write most of this Travel Spot. Pleasingly, there was plenty of seating at the gate, although whether it would have been enough for a bigger plane (once again I was flying on a Boeing 757, unfortunately not the same plane that I flew out on) is debatable. There were a few power outlets, more than at Manchester, but still not enough. I stuck it out for a while, but then wandered off to see if the plane had arrived (when I first got to the gate, I was so early that another flight was boarding, so I hadn’t really explored, keeping out of the way in the computer area). It was at this point that I discovered the second computer area, on the other side of the gate, this time with a back-to-back row of power-points and much more comfortable stools. Better late than never I suppose. A minor black mark against O’Hare is that the Wifi is only free for 30 minutes and while I’ll spend $5 on a good cup of coffee (not that there were any good cups of coffee to be had), $5 for a couple of hours of Wifi seems unreasonable somehow. However, that’s a minor thing and, on balance, I think O’Hare and Terminal 3 is winning this one (although I still prefer flying out of Terminal 5, all things being equal). I’d learned from my experience at Manchester and positioned myself near the gate when it came time to board. Once again, I was in group five (out of seven) and this time I paid more attention. Groups one through four are what’s called priority boarding and, for this flight, both on the way out and here, on the way back, there didn’t seem to be many people in the four priority groups. Since this includes all of business class (with a total of 16 seats on my 757), it’s perhaps not that surprising. The result is that groups one to four are called very quickly and, before you know it, group five (my group) was called. Once again, no-one was queuing ahead of time, so I was able to walk straight up to the gate and onto the plane. I suspect on a bigger plane, with more people in the priority groups, this will change, and people will start to queue when the priority groups are announced, but here it worked like a dream and I boarded in minutes. I wrote a lot about the American Airlines Boeing 757 on the flight out and the flight back was no different. Once again, I was at the front of the economy section in one of the bulkhead seats. On the way out, I’d booked seat 9D, the aisle seat on the right-hand side, which meant that since the door was on the left, I wasn’t too badly affected by the constant stream of people coming onto the plane. However, for my return, I’d booked seat 9C, which put me right next to the door. Clever. Based on my experience on the flight out, where the couple sitting on the left-hand side (seats 9B and 9C) had a fairly miserable time of it, I was regretting my choice, but it turned out not to be as bad as I thought it would be (a common theme for this trip). Although I had a constant stream of people filing past and the occasional person wheeling a suitcase over my toes (that’s why I have boots on in the pictures), I found that I could largely settle down in my seat and get on with things (in this case, writing this Travel Spot). I was very glad that I was one of the first people on the plane, which meant I got settled before the main rush and was able to put my bags in the overhead bin above/behind my seat. The alternative would have been to get on last, which avoids the problem of the people filing past, but would have left me with the problem of where to put my bags (the overhead bins at the front tend to fill up very quickly). So, on reflection, 9C wasn’t as bad as I thought it would be, although I still prefer 9D. However, I think that the best seat of all might be 9E, since there’s a gap between it and the door, so it’s like sitting in the aisle, but without anyone walking past you. Of course, the next time I take this flight, there’s a good chance that American will have upgraded the route to Boeing 787s and I’ll have to get used to a whole new seating plan… Definitely a first world problem! The flight itself (and I never tire of writing this) was smooth and uneventful. The food was okay, but I had a different meal this time (Teriyaki Ramen). It wasn’t bad, but not as good as the stroganoff I had on the flight out, plus there was no cherry crumble cake. Being a night flight, the lights went out after the food service, but since it was dark outside, this seemed fair. It only annoys me when it’s light outside! The flights from America to the UK are always shorter than the corresponding flights from the UK to America due to the prevailing winds. We took off on time (19.05), arriving Manchester at exactly 7 o’clock in the morning, a flight time of just under seven hours compared to over eight hours on the way out. One final observation. America ends its equivalent of British Summer Time (Daylight Saving) the weekend after the UK does. Rather annoyingly, I was in America the weekend the clocks went back in the UK, so missed getting my extra hour in bed, then flew back the following Thursday, so missing the weekend when the clocks went back in the US as well! So no extra hour in bed for me this year. Very definitely a first world problem! So, after all that, which flight/route did I prefer? You can find out after the gallery. Without a shadow of a doubt, if I had to fly from Manchester again, I’d take the direct flight with American. The fact I don’t have to change planes really tips it in American’s favour. Add to that excellent service and great aircraft and you have a winning combination. If, for whatever reason, I couldn’t take the direct flight, I’d go via London with British Airways, flying to Chicago with whichever British Airways/American flight offered the best deal, with an inherent bias towards American’s 787s over British Airways’ 747s (although it looks like British Airways will be replacing the 747s with Airbus A380s next year which could change that equation). While this route means changing planes, the experience I’ve had has been smooth and painless (other than the inherent pain of going through security, hanging around an airport and boarding a plane all over again). The final option, flying with United via Newark, is one I would take as a last resort. My experience wasn’t so horrible that I’d put it in the “never again” category, but avoiding having to take an internal flight in the US is a major motivator. I also found United’s aircraft and overall service inferior to American Airlines, although I’m aware that I’m judging this on the basis of a handful of flights. In the meantime, my next trip will be out to Shanghai at the end of the month, flying business class with China Eastern, which should be fun. Watch this space!